In 1963 and again in 1967, my father became unwell; several times I took the trip to Boston to visit him. When I'd tell the Rebbe of my plans, invariably he'd ask me to visit the famed scholar Rabbi Joseph Ber Soloveitchik, and bring along the latest Chabad publications, more specifically the works of the third Chabad-Lubavitch Rebbe, the Tzemach Tzedek, which incorporated many Talmudic subjects that Rabbi Soloveitchik would appreciate. In 1980, Rabbi Soloveitchik came to a farbrengen (chassidic gathering) at Lubavitch World Headquarters. The Rebbe greeted him and then delivered a scholarly Talmudic talk. Though Rabbi Soloveitchik only planned on staying for a short time, due to his precarious health, he ended up leaving close to 11:30 p.m. The next day, I went to see Rabbi Soloveitchik in his Washington Heights apartment. He mentioned that when he speaks and holds lectures, he arrives with a pile of notes to aid him in delivering his dissertation. "Beim Rebben iz nisht geven kayn zachen," he said in Yiddish, "but by the Rebbe there was nothing..." The Rebbe went from Torah verse to Talmudic sources to commentaries, brilliantly expounding his thesis—without the assistance of notes. Rabbi Soloveitchik said that this was a phenomenon he couldn't grasp. He continued by referencing the ancient "libations celebrations," held in the Holy Temple during the holiday of Sukkot, from which the Prophet Jonah derived his prophecy. Rabbi Soloveitchik continued, "Now I understand what Jonah experienced"—alluding to the great inspiration he received while listening to the Rebbe "pouring" Torah. 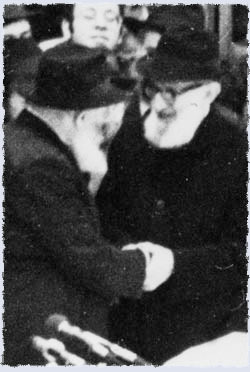 Rabbi Joseph B. Soloveitchik is greeted by the Rebbe at a chassidic gathering in Lubavitch World Headquarters. I had the opportunity to speak with Rabbi Soloveitchik shortly after the Rebbe began his campaign to encourage women and girls to light Shabbat and holiday candles. I asked Rabbi Soloveitchik regarding the candle-lighting custom in his prestigious family. Rabbi Soloveitchik answered that it was the custom in Brisk, his family's hometown, for young girls to light a candle. However, he did not know if they began at the age of three or later. 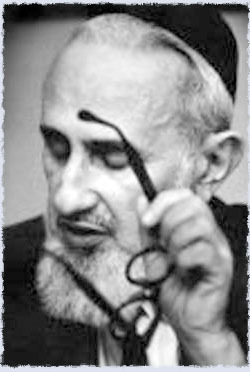 I was told by someone who was in synagogue with Rabbi Soloveitchik in the days following the Rebbe's heart attack in 1977, that Rabbi Soloveitchik once began crying during prayers. Someone asked him what happened, and he responded that he'd heard news of the Rebbe's condition, and "I can't envision a world without the Lubavitcher Rebbe..."
Click here to read more about the relationship between the Rebbe and Rabbi Soloveitchik. Rabbi Krinsky served as a secretary to the Rebbe, Rabbi Menachem Mendel Schneerson, of righteous memory, for more than 40 years. Adapted from an interview of Rabbi Yehuda Krinsky by Yitzchak Frankferter of the Mishpacha Magazine. Many have struggled to describe Rabbi Menachem Mendel Schneerson, of righteous memory, the seventh leader of the Chabad-Lubavitch movement. A task so daunting due to the multifariousness of the Rebbe’s personality and achievements. Rather than attempting to describe the Rebbe, this forum will share hitherto unknown tidbits of information about his life and teachings — information that was recorded in writing, audio and video. Join us as we explore the Rebbe’s life and teachings. Manuscripts, letters, firsthand experiences and more. Rabbi Yehuda Krinsky served as secretary to the Lubavitcher Rebbe for over forty years, and is the chairman of Merkos L’inyonei Chinuch, the educational arm of the Chabad-Lubavitch movement.